With the Winter Olympics and Six Nations in full swing, you would be forgiven for thinking the English Football League took somewhat of a back seat on Saturday. But try telling that to the managers and players who are counting down the six-pointers, must-win games and cup finals in their bid for success. BBC Sport looks at five things you may have missed, including the comeback of 'Bristanbul' and the latest in the chronicles of Marcus Bean. A team in the Championship play-offs leads 3-0 at home to a side in the bottom three after 37 minutes - it's going to end up a cricket score, isn't it? When Famara Diedhiou scored Bristol City's third, it prompted many of the travelling Black Cats fans to start their long journey north at half-time - even Sunderland themselves said they "couldn't blame them", in a tweet that was later deleted. However, three goals in the last 20 minutes, the last of which a 92nd minute Marlon Pack own goal, saw the game finish 3-3. The comeback is already being coined 'Bristanbul', in reference to Liverpool's famous Champions League turnaround against AC Milan in 2005. "I have to hold my hands up and say tactically I got it wrong in the second half. I should've settled for 3-0," City head coach Lee Johnson told BBC Radio Bristol. "I probably got a bit excited and felt that they were there for the taking. We had chances but we crumbled and I should've given the lads a bit more help." Johnson's opposite number Chris Coleman summed up the madness of a memorable ending perfectly. "We were complaining to the fourth official that there should've been more time added on, and when we scored we were telling him to blow the whistle - that's football," the Welshman said. A striker comes up against his old club, doesn't score and the game ends a draw... what's the big deal? You have got to delve a bit deeper into the Derby v Norwich match to see the sizeable role played by Cameron Jerome, who only left the Canaries for Pride Park last month. With the Rams already ahead, Norwich won a penalty and as Jerome's former strike partner Nelson Oliveira stepped up, he openly gestured towards keeper Scott Carson to tell him which way to dive. Carson dived to his right, saved the kick and all was great - but Jerome went on to concede a spot-kick himself in the second half, which James Maddison converted to secure a 1-1 draw. Agent Jerome's insider knowledge could only get Derby so far. It's not very often we feature a player two weeks running, but Wycombe midfielder Marcus Bean's goalscoring purple patch is too good to ignore. 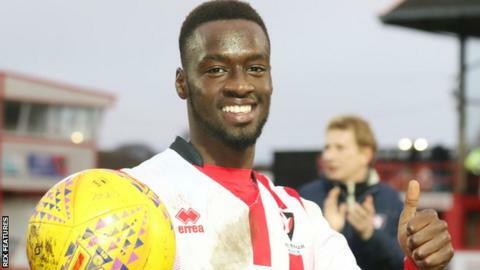 Last weekend he scored his first goal in 103 games and two-and-a-half seasons at the League Two side - a 96th-minute winner - which saw him sprint the length of the pitch to celebrate with his parents, who had already left. The 33-year-old Jamaican was at it again on Saturday, lashing in an equaliser at Exeter to ensure the Chairboys stayed in the automatic promotion places, but opted for a lower-key celebration. "It was never in doubt was it. He's on fire now, the kid," Wycombe boss Gareth Ainsworth told BBC Three Counties Radio. "People are saying he's on two goals in two games, I'm saying two in 105." Ever heard the one about a Yorkshireman who has his first game in charge in a Yorkshire derby and then has his big day ruined by a fellow Yorkshireman? Boyhood Barnsley fan Paul Heckingbottom left the Tykes to become Leeds boss on Tuesday but could not prevent his new side losing 2-1 at rivals Sheffield United to extend their winless run to eight games. "I thought we got caught cold at the start of the game," he told BBC Radio Leeds. "We don't want to be an off-the-cuff team, we don't want to be a team that relies simply on a bit of magic." Sheffield-born Billy Sharp did the damage for the Blades on his first Championship start of 2018, scoring the 200th league goal of his career to open the scoring before finding a winner from the spot. United are now unbeaten in their past 18 Yorkshire derbies since losing 1-0 to Barnsley in November 2014. The so-called 'new manager bounce' - not an exact science but most bosses seem to get that improvement in results when they take over a struggling side. Southend manager Chris Powell must feel like he's been on a space hopper since replacing Phil Brown less than two weeks ago, such has been the Shrimpers' upturn in form. From a side that had lost seven of its past eight League One games, the Essex side inflicted a first defeat on leaders Wigan since November to make it three wins from three under the former England defender. Asked how he felt to break a club record, the first permanent Southend boss to win his first three games in charge, Powell told BBC Essex: "It doesn't mean much to be honest. "I've been here just over two weeks and I just couldn't ask for any more, but I will because that's what I have to do."